The 2018 Cork County Cricket Club Annual General Meeting took place on Monday, 26th November, at the Mardyke. As always the meeting offered a forum for members to to engage with the clubs committee and regarding the season just gone and looking to the challenges that lie ahead in 2019. A motion from the Youth sub-committee was approved at the meeting which will see a member of that committee attending each of the main committee’s meetings. 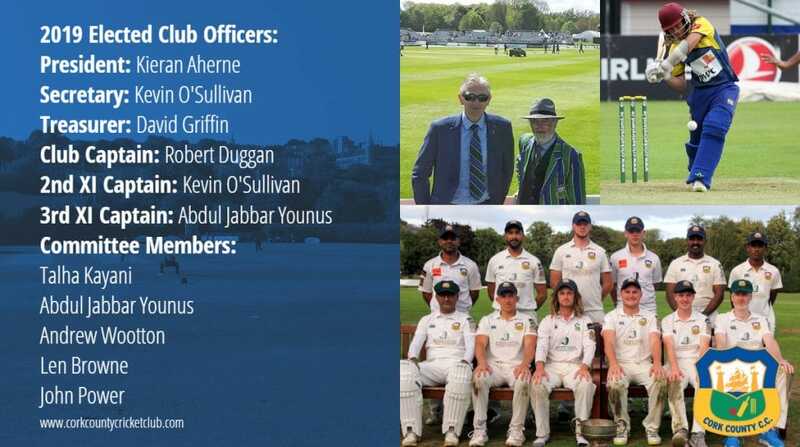 The Club Captain will Chair the selection sub-committee and will nominate a captain for Cricket Leinster competitions in due course, but will be the de facto captain in all other 1st XI competitions unless otherwise stated. The Munster Cricket AGM took place on Sunday, 2nd December, at the Mardyke and saw a number of Cork County members elected to roles on the Executive for the coming season. David Griffin was re-elected as Chairperson for another three term and will continue to oversee the implementation of the Munster Cricket Strategic Plan and the ongoing work to enhance the governance structures of the Union. Robert Duggan, Veena O’Sullivan & Matt Reed were also elected as ordinary members to the Executive for 2019 and we thank them for their commitment and work for the club and Union. In fact, Veena O’Sullivan is only the second female member of the Munster Cricket Executive Committee following in the footsteps of Amanda Lanigan who served as President from 2005 to 2007. This entry was posted on Wednesday, November 28th, 2018 at 12:50 pm	and is filed under Cork Cricket, Events, Munster Cricket Union, News.